Sisters: Barbara, 2015, 5.5’h x 20’w, plywood and paint; Southern California ding-bat apartment signage dropped off at the beach for a day. I had the opportunity this summer to sit down with San Diego-based interdisciplinary artist and educator Allison Wiese while she was in residence at the Neon Museum studio in Las Vegas. Wiese spoke with candor about issues central to her whip-smart creative practice, including humor, risk-taking, and the decision-making process. Andreana Donahue: You work with a wide range of media - have you established certain rules for selecting materials or objects? Is there any material you’ve chosen to stay away from? Allison Wiese: I'm generally uninterested in certain kinds of representation. So there are some materials that I haven't ever used in certain ways. Clay is so damn plastic, for instance. This is one of the wonderful and interesting things about it. Yet while I've been hoping to slip-cast novelty whiskey bottles in the shape of books for years, I have no interest in sculpting a book or any other representation. I want to make these gag bottles that you put booze in! I love employing objects that have moved through time and space and meaning(s): tossed out Christmas trees, wooden doorstops, and appropriated texts. I'm less interested in altering raw materials. I'm happy to create sculptures that are near-actual objects if there are few meaningful distinction in their fabrication and appearance (some of the road signs I've had fabricated fit this description, as well as faux haystacks and corn piles that let you hide inside them) but they rewire something in space, time or mythology. I've tried and failed to use thrift shopped prom dresses at least three times. I can't say I've yet chosen to stay away from them for good. I can't count them out yet? I don't have a set of unyielding or negative-condition rules for my work, though, so I keep finding ways to make the kind of work that excites me the most, while teasing out the exceptions to my own proclivities as a way to extend them - or maybe just understand them better? Vamp, 2006, variable dimensions, Theremin, solar audio system and wine barrels, Museum of Contemporary Art San Diego, La Jolla, CA; Museum visitors, sea gulls and maybe even palm fronds can activate the solar-powered electronic instrument, serenading the Pacific Ocean (or the surfers changing out of their wetsuits on nearby Coast Boulevard). AD: What role does research play in your process? AW: There's a label applied to some artists - research-based. Artists make new knowledge in the world as surely as chemists, and artists' initial information doesn’t come from nowhere - there’s a gathering that takes place. Some artists can be very disciplined and extensive in the research they do. It’s useful that we have the category and that artists refer to themselves this way, if it calls attention to one of the ways we work. I’m leery of applying it to myself, though I do some research, because I think I act as a big old somewhat playful filter, as many artists do, and there’s not a typical form or process that my research takes. What I'd refer to as research may be no more than what most artists do, so I don’t adopt that title. The kinds of information I gather range from a historical anecdote to a personal interaction with someone on the street. I'm not systematic, nor bound by the goals or rules of a historian, natural scientist, ethnographer or sociologist, and don't pretend to be. AD: Would you describe it as a more intuitive process, for instance you might start reading about one subject which then leads to another? AW: People are generally much more used to associating intuition with the production of art than research - the presumption is that of course you get to use intuition, you’re an artist. I try to ask my students to earn the right to claim intuition. I hope that I also ask myself to sometimes edit or justify my acts of intuition, but I can’t deny them, they’re there. I think these are the two exact questions to maybe ask first about what happens when my practice collides with a particular place that I want to both think and make work about. Of course I want to do research, I don’t want to just superimpose my first thought. I'd like to be changed by, or somehow learn from, the experience of a place. But I will also always cop to the fact that there’s an enormous amount of intuition involved and that I always bring myself to the project. So I think because I’m interested in history and culture, I do a lot of poking around, but not in the disciplined way of other fields. What I feed into the process doesn’t always come out the other end in a way you might expect it to at all. For me it’s really important to look at what’s there around me already. Because a lot of my work takes up cultural or political history in some way I do a lot of informal gathering and thinking. Strange acts come out of artists, so sometimes the way that information is turned through me is not the way even I would expect. Reduced for Quick Sale, 2004; Discounted bouquets delivered to the boarded up houses that surround an upstate New York artists residency. AD: Often you generate interventions that aspire to win over a particular place or unfortunate situation. Can you talk a bit about your ongoing set of ideas surrounding the romantic gesture? AW: I'm suspicious of nostalgia as well as many kinds of conventional expression. This can create some interesting conundrums for anyone, artist or otherwise. Many of my projects involve collisions between the small, improvisational or personal and the large, mythical or official. There's some necessary failure built in when you address a pick-up line to an entire rust-belt city, or leave wilty flowers for a house. Somehow, however, I hope that there's something redemptive in my work. AD: You sometimes extend and re-imagine fleeting comedic moments (such as pick up lines or physical devices). Can you explain this and how you approach humor in your work? AW: Humor is incredibly important to me, and I'm glad to see it discussed more now in contemporary art than perhaps ten or twenty years ago. I often think there’s something incredibly funny about my work and I’m gratified when somebody else sees that. It’s also generally very earnest work. One of the pick-up lines that I put on a theater marquee in Utica (in upstate New York, in the middle of town), resulted in a request for a local TV news interview. You could rent the marquee, and in fact it had been celebrating somebody’s fiftieth wedding anniversary the week before, so it wasn’t a novel thing to see something other than a movie title on it. They wanted to talk to me about it on the morning show, and the whole thing ended with me explaining on the local news that this was an attempt to seduce the city. Of course, it was. The pick-up lines that I used were not the ones that contained the cheapest or meanest jokes, I chose come-ons that were friendly, which there are not a lot of. These were pre-existing lines I'd heard, I didn’t invent them. A lot of the humor in my work is in displacement, of time and space and scale, that can be both perverse and playful – I'd say funny. I was living in Houston right before the year 1999 changed to 2000, when there was a belief that there was going to be a horrible Y2K problem and all computers were going to go haywire. A Cuban restaurant that I loved was the only institution I had any relationship with that actually suffered a Y2K problem. For four or five years, the receipt you got when you went through their drive-thru registered purchases as having occurred during 1903 or 1904 or 1905. As far as I was concerned the drive-thru was a time machine. This is the kind of proposition I love to try to create as an artist. Mortgage Lifter, 2015, 9’h x 9.5’d, tomato plant; An heirloom vegetable with an evocative name appears to volunteer on the edge of San Diego’s former sewage sludge drying field. AD: How much explanation do you typically offer viewers about a piece and the specific histories of a site? Is it important for them to arrive at the intended meaning or is it acceptable for it to remain a mystery? AW: There's a negotiation. For instance, the church tower in Charlotte that I turned into a Morse code beacon (it transmitted the lyrics to a Hank Williams' song, "Oh Lonesome Me"), was, in my mind, communicating with another piece of architecture that was linked to the church-turned-art-center by funding and history, I think one of the essential luxuries of making work in public is that it may not be recognized as art, and the question may very well be "what is it doing?" before "what does it mean?" A viewer might arrive at meaning through “What is it doing? What’s happening?” There is no wall text for work of this nature. On the other hand, I have to be aware that not everybody will engage in the same way, and I like to think there’s a couple of ways that the work interacts with the world. The primary audience for the Morse code piece lived in the condos across the street, drove past, walked by, or saw it from another building, and didn’t need to decode the Morse signal to understand that something was happening, that someone was up in that tower, and that the tower was trying to communicate. Because that work was well-documented, there's a secondary audience that gets to experience the work alongside a descriptive text. There were also people who were coming at it from the inside who could see that it was jerry-rigged with extension ladders and a PC. I think the answer is not at either/or; I don’t want things to be dependent on explanation, but I also do not expect the broadest audiences to all engage in the same ways. I do think that a lot of work of this nature is more accessible than many institutions give it credit for! I love talking to audiences, but I also love hearing from them, and have always been happy to understand where they meet my work. 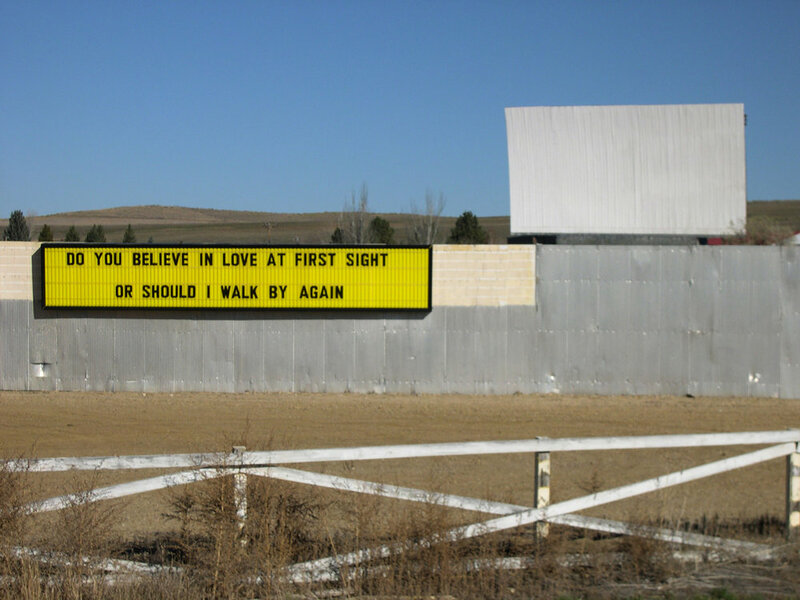 Sheridan Line, 2004, marquee text, Sky Line Drive-In Theater, Sheridan, WY; A pick-up line addressed to the Great Plains from Sheridan’s closed-for-the winter drive-in theater. All images courtesy the artist. AD: I’m curious if you’ve ever been asked by a space or institution to install a site-specific work outside of its original context. If so, how did you negotiate that decision? AW: Not specifically, but documentation of my site-specific works has certainly been misinterpreted as a solely photographic art object. I’m sure this is a common experience for artists who use photography to document work that's installed outside of museum contexts? I’ve been asked if this type of image can be exhibited and stand alone, and in some cases I think they actually can. I’ve shown and sold photos of at least one of the marquee pick-up lines, for instance. Initially I thought “That is only for the cowboys who drive on the road between Sheridan and Billings, that’s not for anyone else. That’s not a photo.” But of course simultaneously, the image is on my website as documentation, being read by a whole other audience. My initial response was probably a rebuff of someone who didn't show interest in the nature of the original act. Later I thought about it, and I didn’t know why it couldn’t be a photograph, too. The question is less problematic for me when I feel the work can stand alone well as an image. Not all the site-specific works I’ve made can do that. Or maybe it's only my limited photography skill that narrows the audience for some of the larger works I make? I’m not a purist; if something can communicate in a new way, then I might be very interested in moving it or taking some shard of it somewhere else and re-configuring it. Other things can’t be moved or redeployed. I borrowed a flock of sheep for an exhibition at a historical home on the campus of Johns Hopkins; The sheep never could have been exhibited elsewhere because they were linked to that place. I wasn't interested in working with sheep anywhere else. At least not yet. AD: In a recent talk, you mentioned the importance of changing and taking risks in your creative practice. Can you elaborate on the value of this as an artist? AW: I'm finding out that nice things can come out of making work for decades. You are talked out of making something by someone occasionally, only to realize many years later that pretty much any time you were talked out of making something, you should have just gone ahead and made it. At several points, you will have a really good sense of what you are doing for a spell, and what your particular work is truly about. When this assuredness prevents you from exploring a series of divergent ideas that don't "fit" you are suddenly left with a few choices. You can continue to make pretty much the same work, with less curiosity about it. Or you can make something that you may not understand very well for some time. If things work out, you figure out (perhaps much later) where the oddball idea connects meaningfully to what came before. Allison Wiese is an interdisciplinary artist who makes sculptures, installations, sound works and architectural interventions. Wiese’s work has been exhibited throughout the United States at such venues as Machine Project in Los Angeles, The Museum of Contemporary Art, San Diego and Socrates Sculpture Park in New York. She was the recipient of a 2007 Louis Comfort Tiffany Award and has received grants from Art Matters, Creative Capital and the Cultural Arts Council of Houston. Wiese is a fellow of the MacDowell Colony, an alumna of the Skowhegan School of Painting and Sculpture and was a Core Fellow of the Museum of Fine Arts, Houston. She learned to walk and talk in Brooklyn, drive in Southern California and everything else important in Texas. Wiese currently lives in San Diego, where she teaches at the University of San Diego. Andreana Donahue is a visual artist and artist advocate from Chicago who has organized and exhibited in group and solo exhibitions in Alaska, Chicago, Iceland, Los Angeles, Miami, New York, and Nevada. Donahue’s project-based practice engages with various disciplines and concepts, but reflects an ongoing investigation of transforming everyday materials through labor-intensive processes and highlighting connections between outwardly unrelated narratives. Artist residencies include the Wagon Station Encampment at A-Z West, The Icelandic Textile Center, SIM in Reykjavik, 100 West Corsicana in Texas, and the Vermont Studio Center. Currently based in Las Vegas, Donahue is the recipient of a 2018 Nevada Arts Council Fellowship.